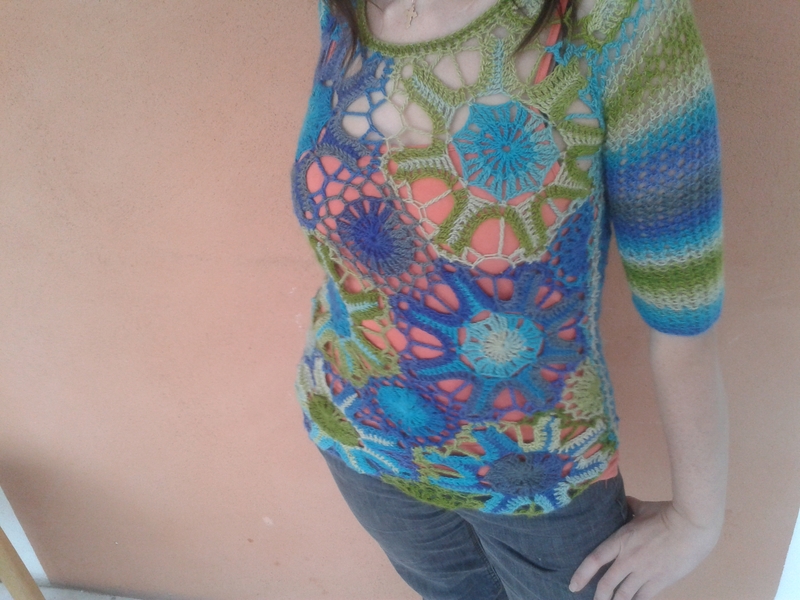 So, I have finished the top I wrote about here. And I absolutely totally love it! I think that this is one of the best patterns I’ve ever seen for self-striping yarn. Here’s the link to the pattern :). Buying that magazine was totally worth it, as I’m now making another garment from it, but even if I only made this top, it still is worth it! I think this is the best sweater I have made so far. I don’t actually do many, because my previous attempts were not so encouraging :S I’m always drooling over tops in this style when I see them in shops, and now I have one, and I made it myself! There’s a discrepancy between the chart and written directions for large shoulder motive. The chart shows the beginning of round 3 is between 2 petals. Also it shows sc1, ch 1 between the sets of two petals. Written instructions start round 3 at the beginning of the 1st petals and have ch2. I followed written instructions. I also think there is a mistake in the first round of the sleeve, for larger sizes – I get 8, not 6 repeats of dc,ch5, dc over the shoulder motive. For larger size, the petals of the flower are longer. Separator image Posted in My kniting & crochet and tagged with crochet, crochet motives, self-striping yarn, Tammy Hildebrandt, top.